We have to do what the government in its duty of care to Australians fails to do: inform the population of its UN obligations in a generous and compassionate way, not trespass human rights conventions, and grant equality and justice to all. It was here at Curtin University that I learnt, first from Professor David Black, that it is usually Labor which regards social welfare for all as a right, and that it is usually a liberal government which argues that you have to earn your welfare by being a deserving citizen. I wrote my initial presentation for this conference during the Christmas weekend last year. It gave an outline of the concept of social action strategies in post-war western societies, drawing from the civil rights movement in the USA, pointing at Dr Martin Luther King Jr and Mahatma Ghandi, the fall of the Marcos regime in the Philippines, and the achievements of social action strategies in forcing government change, and I would have led you during a 40-minute presentation to an understanding of the resilience of imprisoned, innocent and traumatised asylum seekers in Australia's new type of prisons: the detention camps, as the asylum seekers themselves set an example for Australians of forcing change through social action. In that initial paper I suggested that the most appropriate social action icon in this case would be a tent embassy, where we could hand out an alternative Visa document to visitors and detainees alike. I have dropped that line, but for no other reason than that it would have taken too long to lead you there - after I received word that the presentation could not exceed 15 minutes. Instead of elaborating in that direction I propose to look at the Visa document I wrote for such occasion. The document you have in front of you, The Australian People's Refugee Visa, is and can become a document which tells Australians in plain-speak what the Howard Administration fails to do: sticking to the letter, intent, and the spirit of the UN Convention pertaining to the status of refugees. Rather than attacking the government, the document probably just exposes the government in several ways, and if it does, I don't mind at all. It seems that after the September eleven events of last year, we indeed have a world that will never be the same again, but not really on the part of the citizenry. In several countries we need to point at governments that have brazenly abandoned international conventions under the excuse of the never-before seen disaster of a mass attack on American institutions and people. Societies seem to be in change, but in a rather disturbing way. After September eleven, there is growing concern about the actions of the Israeli Sharon government in relation to the Palestinians. The voices raised in the USA about the Bush Administration's treatment of the Taliban prisoners as well as about abbreviated judicial process are becoming louder; and I believe in Australia we're approaching one of the most important juxtapositions in our modern history. That junction of choices in Australia is in my view the choosing of Australians between on the one hand provincialism which, combined with xenophobia still lurks very disturbingly in our minds - and on the other hand generosity, a return to what was displayed during the last of the Fraser years, where welcoming of Vietnamese boatpeople closed off the era of the White Australia policy and announced the new era of multiculturalism. The battle in Australia is clearly not fought within the current government's ranks: apart from a few dissenters who keep their opinion well hidden from public view, this government is as blatant as you can get it in its disregard of human rights conventions and of the United Nations Refugee Conventions. If you want to grasp the issues, go and listen to the talkback radio shows, and you'll hear the conflict. The conflict plays within the Australian psyche, and it defines itself by a demarcation between two extremes: an exclusion of those who we fear may take over our country and heritage, who may take our jobs and our truly Australian code and way of life from us, and an inclusion of those who are in need, who are in a desperate state, and who are asking us for help, because they came to us in the trust they had in our national friendliness, openness, receptivity and a sense of embrace, and, most of all, because we are a western democracy and a signatory to those UN Refugee Conventions. As someone who grew up in post-war Europe, still surrounded by the smell of Auswitz and Bergen-Belsen, within a country which relied for its new vision on institutions like the UN and NATO, and a country which hosts the International Court of Justice, I find it extremely repugnant to observe Statesmen in Australia disable the judiciary in the independence of carrying out its task, and to observe Judges throw up their arms in helplessness in this silly game of trying to apply justice to minor offenders in order to satisfy outraged voters, having become an extension of a desperate elected arm of government and an instrument for success in re-election of such government. Meanwhile, our National Statesman John Howard sat in a vacuum of non-action when the calls came for him to intervene in State and territory politics, and as we see now, mandatory sentencing is closely connected to mandatory detention of asylum seekers: Justice Marcus Einfeld does not shy away from naming them in the same breath. Howard had an active motive in maintaining his silence, as well as thus sponsoring the status quo. It was useful to him. What was born within the context of this Aussie rules game of compulsory jailing, was a sanctioned attack on the principles of post-war democracy, and governments got away with disabling of the separation of powers because we insisted on doing our own thing down-under, and our national confession of faith: "She'll be alright, mate" underestimated the disastrous consequences and deflated the voices of the troublemakers who dissented. Since the introduction of compulsory jailing we need to conclude that Australian governments are not democratic but self-styled governments, and from this new ideology in Australian society it is but a short step to jailing those that bother us without due process, and taking further shortcuts: don't we all resent the lengthy court processes and traffic jams on the Highways of Justice? So - and listen how ridiculous it sounds - in order to disempower people smugglers we jail asylum seekers. Next, the Minister of Immigration invents a series of justifications: queue jumpers, illegals, illegal immigrants, economic refugees; he also casts doubt on the process of the United Nations, calls those jailed asylum seekers who organise rightful social action troublemakers, steps up security to make detention centres look like fortresses; he bans access of the media, bans full and unfettered access of lawyers. And blaming Australasian Correctional Services or the Riot Squad - Australian Protective Services - for these actions is another mean and quite unbelievable excuse. They work for him, you see, and no Ruddockspeak will fix that - as the Australian wrote last Saturday. And, talking about name-calling, if the Minister of Immigration - who is also the Minister for Aboriginal Affairs - wants to talk about unauthorised arrivals, he had better consult with Australia's indigenous people first. They can nominate a few more groups that should be added to that list, starting as early as 1788. The government further makes adjustments to the refugee review process - yet another step in thwarting the rightful judicial process, and in another collusion with Labor, incisions are made into the Australian territories, so we can keep the eyesore of boatpeople out of the line of sight of any swinging voters in the lead-up to the 2001 Federal Election and beyond and send them to Pacific Island nations with deficits, holding those nations at ransom with sacks of dollars. But the bottom line remains - once you enter a UN signatory country, knock on the door of the authorities, and tell them: "I seek asylum in your country", you have a legal right to be in that country. You have that right from the moment that you finish that one simple sentence. That's how simple the UN conventions are. I'm sure that this legal fraternity is more than adequately equipped to assess whether the Australian government ought to be prosecuted in the appropriate forums for crimes against humanity, and whether the Minister of Immigration should answer charges of vilification or defamation of asylum seekers. 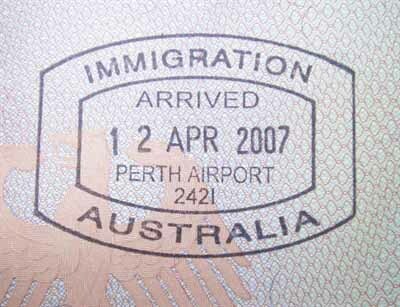 The Australian People's Refugee Visa you have received is attempting to affirm UN Conventions every step of the way. The document is currently under review by about 35 refugee organisations, Democrats and Greens Senators, and - yes - also some Liberal and Labor Parliamentary representatives. The document is an attempt to explain to an asylum seeker what happens if Australia would fully adhere to the United Nations Refugee Conventions, and honour its obligations. The document is designed as a discussion paper for Australians at home, and we hope the media will pick up the tab and publish it, so there can be another series of vigorous radio talk back sessions and letters to the editor, this time guided by statements which incorporate the UN conventions and our obligations as a result of it. We have to do what the government in its duty of care to Australians fails to do: inform the population of its UN obligations in a generous and compassionate way, not trespass human rights conventions, and grant equality and justice to all. It was here at Curtin University that I learnt, first from Professor David Black, that it is usually Labor which regards social welfare for all as a right, and that it is usually a liberal government which argues that you have to earn your welfare by being a deserving citizen. It seems that we have experienced another shift of lately: under the current government you also have to earn your basic human right by being a good citizen. To this belongs the right to due legal access as well as representation, and recourse through the way of appeal, and your right to free and open speech - your right to speak to the media, and your right to go free of incarceration. Because it appears beyond doubt that refugees in the camps don't have that right per se. A number of items in the document probably jump at you at first glance, and in saying that I stress that the document was deliberately written in everyday language. We want this to be read by the Mums and Dads in Australia, we want it to be accessible by school students, and by people who would never tackle a legal document in their entire life. Yes, you read that right. If you're not happy, tell us. We want to be a great and just country. If you're not happy, let us know. If we don't listen, get a representative to speak for you. If we still don't listen, get a lawyer. We will pay for that, because we have a great deal of interest to be a fair-go, blameless and just society. On all intersections of the road to acceptance it has been attempted to refer to aspects of Australians being proud of their country, of making people feel welcome, and to represent the spirit as well as the letter of the UN Conventions. It is a new approach to events in Australia, and we're learning very fast: if your government blatantly refuses to do the right thing, you can complain, submit a protest vote, but if you want to defend your country, you have to eventually do your own thing. This is by no means the final version of the document, nor is it intended to reach a stage where it is a final version. This document will hopefully do the rounds in Australia as a discussion paper for ordinary Australians and a gift to detainees for those who want to express that they do not endorse the actions of the Minister of Immigration. I don't want Australia to become a maverick nation. I don't want Australia to become a rogue nation. And we're well on the way to becoming just that. And I'm honoured to be part of a fast growing number of people who do not permit that. Note about online resources: this paper was researched and written in February 2002, and the online resources were accessed at that time - while this web page was created in April 2008. Any pages no longer available will have their hyperlinks removed (such as in Endnote #4). Editorial: Ruddock needs to take full responsibility: "Whatever his intentions, Mr Ruddock should stop behaving as if the detention crisis was all the fault of the people locked up, or the responsibility of bureaucrats and law enforcement official. Politics is about communication, and our elected representatives must not abuse their position by communicating falsehoods. Yet the Government commonly uses a host of loaded terms. Repeated use of "illegals" (for people seeking asylum) or "queue-jumpers" (when a queue for those fleeing persecution rarely exists) and even "Pacific solution" (as if being locked up indefinitely in a makeshift prison on a poor island is a holiday) are misleading. Rather than defend detention through "inappropriate language" Mr Ruddock should instead explain the policy faithfully and accurately - and finally take responsibility for his portfolio."